1) You simply cannot mention 1977 without mentioning Star Wars. For a sci-fi fan like me, this was a before and after moment. It was a great film, and it was the beginning of the a great era in science fiction films. I can’t remember where I saw it. Probably in Florence, SC, as Cheraw had lost its movie theater by then. It occurs to me that young people will one day be able to search their social media feeds and figure out stuff like that. 2) I played a lot of pool at Johnny’s Red Door Lounge, which we all referred to as Funderburk’s. Funderburk’s played a part in a bunch of my songs, including these two. 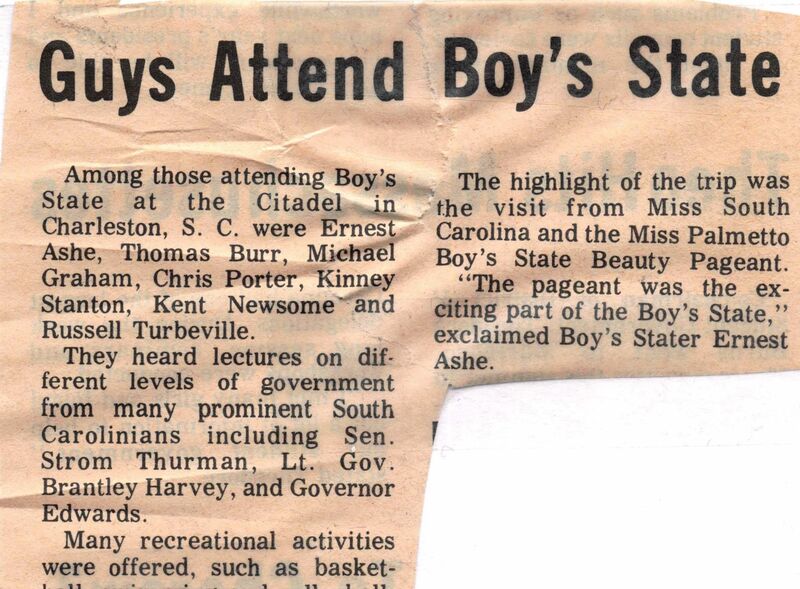 3) I spent the first part of my summer at South Carolina Boys State in Charleston. Here’s a newspaper story. 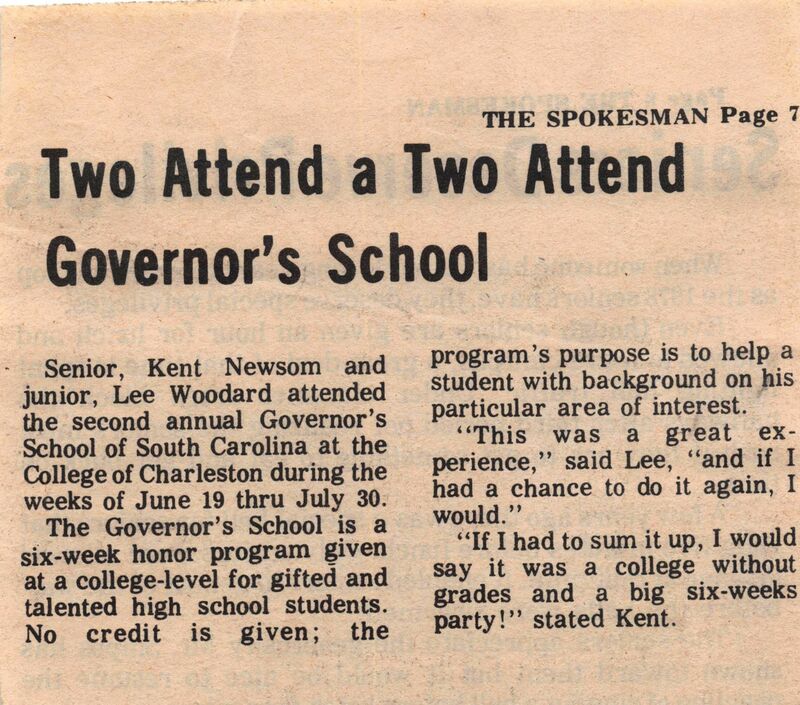 I spent the second part of the summer at Governor’s School, also in Charleston, which at the time was a summer program for rising high school juniors and seniors. 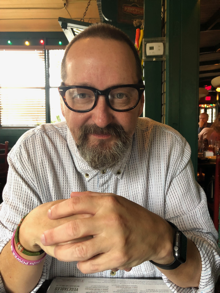 I focused on math, and had my first experience with programming. In Fortran. Here’s a newspaper article (complete with a typo in the title and my name misspelled), in which I eloquently sum up the experience. Much of my year was spent with two records (or 8-tracks) playing in the background. In fact, one time I just about got killed trying to change from one record to the other. Assuming you were alive then, what do you remember about 1977? Posted on March 5, 2014 by KentPosted in LifeTagged 3 things. If I knew at one time I didn’t remember that you attended Governor’s School here. One of Trisha’s mentors, Dr. Jon Newell, led the Governor’s School for many years until state funding cuts led to its demise not too long ago. Nonetheless, the College of Charleston continues to support a well-regarded Honors College, for which Trisha now serves as Dean. The students and their ambitions never cease to amaze… it’s routine for them to be multilingual, start with two semester’s worth of AP credits, have scored 1550 on the SAT, play a musical instrument and/or participate in varsity athletics (sailing, tennis, basketball, etc.). Good thing I came along when I did… not sure I’d be admitted to an obscure community college if I were a high school senior today. I saw Star Wars at the theater in Cheraw in 1977. It was the last movie I saw there. Brett- I had a great time at GS. I met some people I remained friends with for a long time. I loved CoC, and Charleston, the city. It is one of my favorite memories from my youth. You’re right about college now- there’s no telling where I’d have ended up if it was like this back then. Even if I could get into WFU, I couldn’t afford it. Plus the big public colleges in TX have this ridiculous top 10% rule, so even really good students out here have to go out of state. OU, OSU, LSU, etc. are getting a lot of good TX kids now. Scott- Thanks for the heads up. Maybe I did see Star Wars in Cheraw. I remember being bummed when our theater closed, but I was wrong about when it closed. I thought it was earlier. Afterwards, I remember driving over to Florence on dates, eating at Bob’s BBQ and going to a movie. Seems like a lifetime ago.